Newhey Community Primary School in Rochdale has achieved Centre of Excellence status. It was a pleasure to be given the opportunity to return to Newhey Primary for their Centre of Excellence assessment. My lasting memory from my visit last year was undoubtedly the team approach and how the school was there for the children. Returning to the school this year, the passion and dedication from all children and staff was tangible. From the breakfast club where the staff, including the site manager, were active participants to everyone I met during the rest of the day, I had the warmest of welcomes. The children remain firm in their belief that ‘every class is like a family that help each other.’ The school works together in a unique way that really does fill you with humility as you witness first-hand the nurturing and support that the children have for each other and that each and every staff member provides. Newhey still boasts its annual talent show and once again rehearsals have been in full swing! The children are rightly proud of this as they told me; ‘It’s to show what we are truly made of and keep up our confidence’. However, the ethos runs much deeper. This is a school where much more than talent emanates from. The whole atmosphere celebrates the diversity of the school community and each and every person there realises what a wonderful opportunity and a tremendous responsibility they have to provide a safe environment for the children and one where their aspirations are supported. The Headteacher fully acknowledges the immense skill set within the staff team and how everyone works together as a family. Likewise, she is open and honest about the day to day challenges but is insistent that the school does not stand still. As noted in the first IQM assessment, the school is evolving, the children continue to be at the heart of these changes. Since the first assessment, the school has continued to drive forward changes to the internal fabric of the building. They are fully adaptable as a school and even if they know a change may only be for a short term, if it is impactful then that change will be made. The school has ensured that internally the building is safe and secure. Internal doors have been fitted with viewing panels and clear signage has been placed around school for both children and visitors to access. Building work is imminent to extend the building further as the school move closer to securing their PAN. In terms of safeguarding, the school is having the main entrance re-designed and a new secure pathway in place to allow visitor access to be more secure and less disruptive to daily school life. The sensory room has been refurbished and a lot of this was undertaken by staff who willingly gave up their time in the holidays to do this. 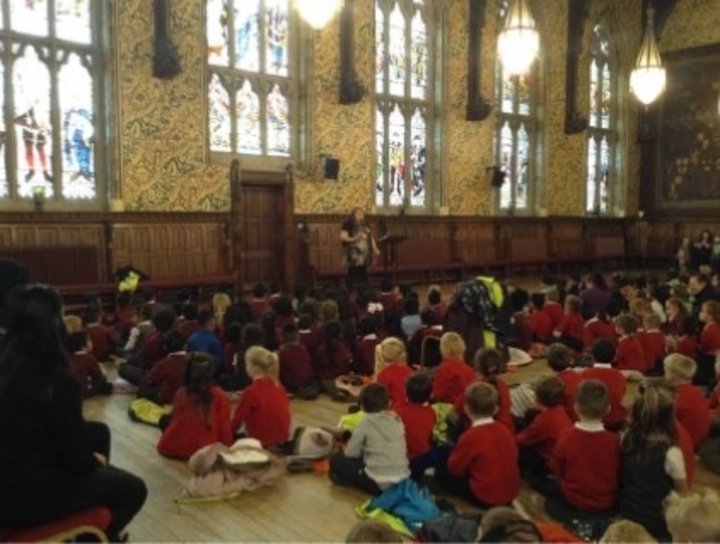 As a result, the room is now utilised to its fullest and accessed on a regular basis by children across school that need that time away from class. Much thought has been given to the outdoor environment in terms of its inclusivity. The school accessibility plan links directly to the IQM SER document to show a truly cohesive approach to inclusion. Where things have been taken away on the playground due to ageing, very quickly a new piece of equipment has been put in its place. The school council remains instrumental in these changes and is relentless in ensuring the school continues to develop and offer further opportunities for the children. Not only has the school invested heavily in physical resources, it places a strong emphasis on its investment in human resources. Changes such as increasing lunchtime staffing have allowed for more activities to be available. The children couldn’t wait to tell me all about their positive experiences at lunchtime and I was amazed by the range of opportunities from Zumba to the hotly contested World Cup tournament! Spending lunchtime with the children allowed me to witness first-hand the wonderful attitudes and values that they exude. The manners towards each other and to the staff on duty were impeccable and what was heart-warming to hear was the way in which children left the dinner table saying to each other; ‘enjoy the rest of your day’, ‘see you later’, ‘good luck in your game’. The hall was indeed a hub of activity and positive vibes emanated from every direction. I would very much like to thank the children who took time out of their day to talk to me and help me appreciate and experience the family feel which has, for me, become the golden thread running through the school. Meeting with other staff, a governor and a parent gave me the opportunity to reflect on the journey the school has gone on over the past 12 months. Once again, comprehensive evidence was presented to me, mapping out in detail the actions that have been completed and the new plans for the coming year as the school continues its journey as a Centre of Excellence. By lunchtime I had been able to see each and every element ‘in action’ and how much of an impact the school makes day in, day out in the lives of the children. The strong partnership between parents is still very much in place despite the disbandment of the PTA. Although disappointed, the school community has been undeterred by this and has continued to provide a wealth of opportunities that parents/carers can be involved with. Parental feedback highlights how rewarding these experiences have been with parents also commending how accommodating the school is for working parents. Governance remains a strength and they are still wholly committed to the inclusive ethos of the school. Link roles have been introduced with a view to raising the profile of the governing body within school. The impact of the school in the wider community is becoming more widespread. The reputation the school has as a beacon for providing an inclusive education is growing and the school is gaining in pupil numbers. Whilst this does bring with it fresh challenges, the fantastic opportunities more than outweigh these as the new pupils continue to enrich the school community. With change brings new opportunities and I closed my first report with the fact that everyone at Newhey has something of value to contribute. That sentiment has not changed and, if anything, has been reinforced during this review. The children talked about the exciting opportunities new pupils bring and how they learn from each other, whether that be friendship, culture, understanding of different needs. Newhey is a school where ‘teachers make you laugh every single day’ and ‘we all get along, we are close and help each other’. To be a part of that ethos is a truly special feeling and one which is palpable from everyone you meet. Having discussed the progress made since the IQM assessment and the school’s drive to keep moving forward with the support they provide to the community, I am strongly of the opinion that Newhey Community Primary and Nursery School should be awarded Centre of Excellence status and be reviewed in one year’s time. Next year’s review will look closely at how the school continues to develop its facilities to share its inclusive practice, promoting links with other settings and agencies. Further evidence of working with an inclusion cluster will also be included as the school are keen to host a cluster meeting and disseminate the strong practice here at Newhey.